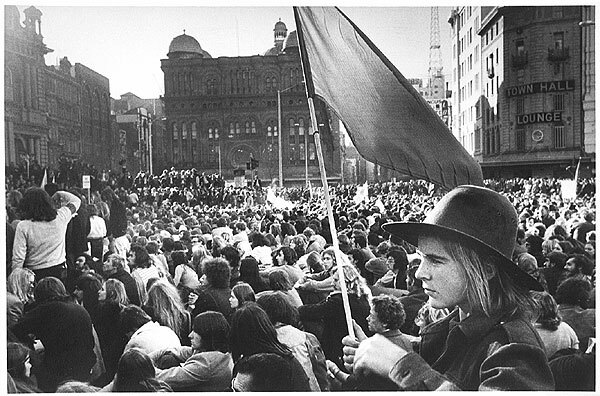 The Baby Boomers are the only Western generation in recent memory that can rightfully consider themselves revolutionaries. The cultural impact of the infant Tea Party and Occupy movements has (so far) been meager, particularly when compared to the U.S. Civil Rights Movement, the May 1968 protests in Paris, and omnivorous sexual revolution of the 1960s and 1970s (for the sake of convenience, we’ll consider the 1989 Velvet Revolution in Prague and the Solidarity movement in Poland as “Eastern” revolutions, i.e. taking place in former Eastern Bloc nations). Growing up as the child of Boomers it was hard not to think of my parents’ generation as existing in an enchanted cinematic universe that mirrored the life stages depicted in the films American Graffiti, Easy Rider and ultimately The Big Chill. If not all the Boomers had been countercultural, many had at least grown up with a singular sense of their own impressiveness. Critics of the ‘60s generation have decried them as a spoiled, selfish lot, whose licentiousness led to an epidemic of divorce and Wall Street greed in the 1980s—the hippies, in other words, had traded in their idealism for fat capital gains and new, hotter spouses. But revolutions, by definition, are messy undertakings that often spiral out-of-control (see: Robespierre) and invite counter-revolutionary backlash (see: Napoleon). If we consider 1968 as the apex of the Baby Boomer’s revolutionary spirit, 40 years later many people are still engaged in the shoving contest known as the culture wars over who was right, and more importantly, how we should live our lives. Into this climate step two important writers, both of them Boomers, who have published books that directly (and indirectly) illuminate the current cultural wrangling in the West: Pulitzer-prize winning American writer Marilynne Robinson (b. 1943) who has a collection of essays called When I Was a Child I Read Books and the popular French philosopher and novelist Pascal Bruckner (b. 1948) has a new book called The Paradox of Love. Marilynne Robinson may be the first American writer since Jonathan Edwards (technically a writer of sermons) to self-identify as a Calvinist. Robinson also describes herself as a Christian, a Congregationalist and an “unregenerate liberal.” She is too modest and Midwestern to add the moniker “one of America’s greatest writers,” but she is, and her fiction has opened up new and grand vistas in American literature. Her novel Gilead won the Pulitzer Prize for fiction in 2005 and it will prove to be a book that is read well-beyond our lifetime. Despite Robinson’s generational affiliation, it is impossible to imagine the Idaho-born Robinson yucking it up with Ken Kesey and Allen Ginsberg at North Beach’s Caffé Trieste circa 1967. Robinson is far too circumspect, far too academic and scholarly; too much of an intellectual to have engaged in the frivolity and boorishness that often passed for serious thought in the counterculture. Robinson is not an radical in the received sense of the word, but a kind of Christian-humanist who operates in that most marginalized of milieus—the world of American letters. Robinson’s book is, in part, a critique of Christian fundamentalism and neo-conservative thought—rekindled in the 1970s during the so-called “Fourth Great Awakening” of American religious fervor—which was, in part, a response to the sexual revolution. It’s hard to imagine philosopher, novelist and cultural critic Pascal Bruckner in any mood but a state of wonder, although his enthusiasms are more terrestrial and grounded in French society where religion has been passé for two hundred years. Shifting from Robinson to Bruckner is a bit startling: it’s like listening to the works of Charles Ives right before attending a Phoenix concert in Paris. In contrast to Robinson’s intricate prose, Bruckner’s work is sparse and pared-down, and like many French intellectuals, he seeks to impress with his wit and originality: “The bourgeoisie and the whore used to have well-defined roles,” Bruckner writes. But in our present age “a streetwalker is often chic and austere, while soccer moms like to dress like whores.” With Bruckner, we are no longer in the cornfields of the American Midwest. In today’s world it doesn’t matter if your personal life is in disarray, it only matters if your political views are in proper order, which is say they all fit neatly in a narrow, ideological box that meets with the approval of one’s like-minded Twitter followers. This is not the intellectual world that Bruckner or Robinson occupies, and maybe that’s what makes them the true revolutionaries—they don’t sound like me, or you, or anyone we know. Robert Fay is California-based writer who recently completed a memoir. Visit his website at Robertfay.com or follow him on Twitter at @RobertFay1.